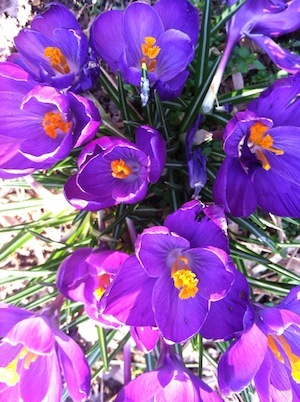 Without fail buds are blooming and bulbs spring forth from the ground… in February. Likewise without fail, the Atlanta area will experience another cold snap, snow or an ice storm before spring decides she’s here for the duration. The rain’s been fairly continuous for about three weeks, yesterday was a balmy 80 degrees! Warm, wet weather spells disaster for bird feeders, especially finch bird feeders. It’s not that humidity affects thistle seed any differently from other seed mixes- it’s the unnatural and exaggerated number of birds feeding from the finch feeders. 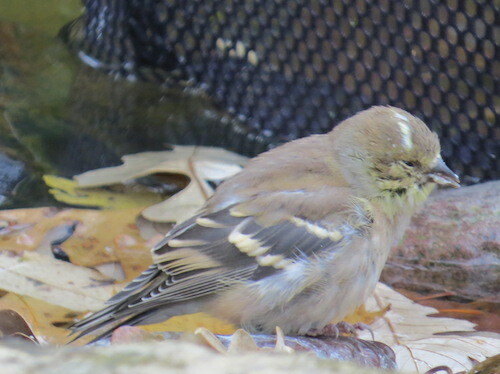 Local populations of goldfinches, pine siskins and house finches are huge around this time of year. Combined with wet or moldy seed means disease can be spread rapidly, with the feeder itself or ground waste below as the main culprit. Mold creates airborne disease which is usually fatal to birds. A form of strep, the most common way it’s passed is via the feeder. Telltale signs of infected birds are swollen eyes, lethargy (they allow you to get very close) and ruffled or unkept feathers. It’s advised to take all bird feeders down and disinfect with a 10% bleach solution. Clean the ground below feeders well. Wait 2 to 3 weeks until the local thistle-eating population has subsided before hanging feeders again. This is a tough chore, both physically (and mentally for some of us bird nuts). So it’s best to avoid and practice good hygiene when enticing birds to your place! Humans do feathered friends no favors at all by causing disease or allowing it to spread. Think Vinyl Birdhouse-Feeder for Valentines! As in do you love wild birds? Vinyl birdhouses-feeders make awesome gifts… for countless reasons. First, they look like wood. Some folks have even insisted they are not PVC or vinyl! Along with the solid copper roof (no metal over plywood) these vinyl birdhouse-feeders are guaranteed for life. It’s a one-time investment that brings birds and much joy indefinitely. Oh yeah… and curb appeal too, they’re quite handsome in the landscape! Second, there’s a wide range from which to choose. Bird Feeder or Birdhouse, which is best? Feeders will see more activity on a daily basis… but they must be maintained. Part of the beauty in these vinyl bird feeders is ease of cleaning. For a more thorough cleaning, simply slide the feeder off of the pos t and take your garden hose directly to it for a good cleaning. Birdhouses on the other hand, only require nest removal after babies have fledged. Another major advantage is that vinyl is non-porous. This means mold and bacteria will not settle into cracks and crevices as it does with wooden feeders. 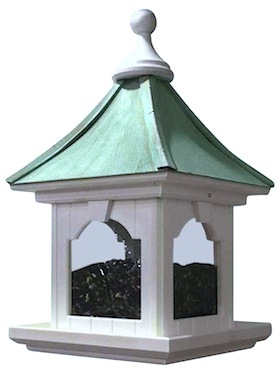 Aside from the traditional Gazebo feeder which is post-mounted, there’s a hanging style with large capacity hopper. This allows for more bird-watching time and less filling the feeder. Two roof options are lacquered copper- which remains bright & shiny for about 4 to 5 years before weathering to a dark/aged finish. Think copper trim on a real house and how that looks dark after a few years. Patina finish is an acid wash applied with heat and remains an earthy and mottled blueish-green color. May you be showered with love (and feathered friends) this Valentine’s Day and always. Use code FH10 to nab $20 off vinyl birdhouse-feeders. They ship for zip too! Bird Cam vs. Super Bowl? In another hour or so, the biggest football event of the year commences… but some of us really couldn’t give a hoot! Even though our home team actually made it to the Super Bowl this year, there’s oodles of other things we’d rather do than watch. 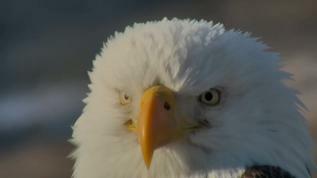 Now, watching one of the many bird cams on Explore.org is mesmerizing! From hummingbirds to owls and bald eagles (go eagles), you can catch live Africa, oceans, bears, bison and northern lights… and so much more! It’s a virtual nature channel in real time. Some of the subjects have names, and their lives are followed over time. Most recently, folks were devastated when Bella Hummingbird lost her eggs to a stellar’s Jay. A force to be reckoned with, Mother Nature is stunning, shocking, glorious and so terribly sad at times… but she remains faithfully resilient. Bella will begin the life cycle again, but for now, enter Luna Hummingbird! Explore.org will even email a daily “Dose of Love” should you choose to subscribe. The site is absolutely free to watch anytime- and any subject of choice. These Nature Cams offer the most amazing glimpses into an unknown world, sans disruption or intrusion. Simply put, Bird Cams create a wonderland and the best part… you don’t even need your own!